Even my 11 year old son took up drawing when he got this. He liked it mainly because of it's title, but the pictures inside are also the right sort of ones for boys 6-12. Love these colouring books. Nice quality (thick paper pages) detailed designs on the pictures, good size (not too big, so easy to pop in your bag and take with you when going out). I've bought quite a few since getting the one for my son, for birthday presents for his friends. Much nicer than plastic toys! I do like this book, but bought it for my 6 year old Grandson and think it's better suited to the 3 year old. It's a shame people don't put an age appropriate note for items. But, fortunately, I could give it to another child. Great idea, simple drawings and shapes to colour in, and subjects that will appeal. 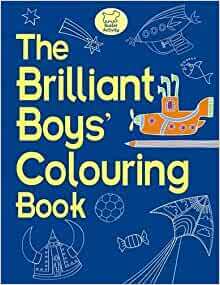 I personally really liked the look of this book but my 5 year old son hasn't taken to it particularly, although he does like colouring. It would make a lovely present and I think he might need to grow into it.